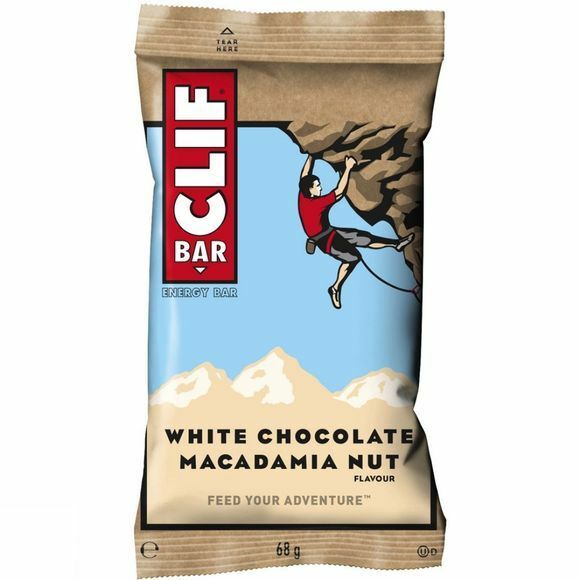 It's the first bar Clif made, and it's still everything Clif are about. Wholesome ingredients. Performance nutrition. And great taste. Whether you're on a 150-mile bike ride or exploring a new trail, this energy bar is built to sustain your adventure. Organic Brown Rice Syrup, ClifPro® (Soy Rice Crisps [Soy Protein Isolate, Rice Flour, Barley Malt Extract], Organic Roasted Soybeans, Organic Soy Flour), Organic Rolled Oats, Soy White Chocolate (Organic Dried Cane Syrup, Cocoa Butter, Soy Flour, Soy Lecithin, Vanilla Extract), Organic Toasted Oats (Organic Oats, Organic Dried Cane Syrup, Ascorbic Acid, Natural Vitamin E [Antioxidant]), Organic Cane Syrup, ClifCrunch® (Organic Oat Fiber, Inulin [Chicory Extract], Organic Milled Flaxseed, Organic Oat Bran, Psyllium), Macadamia Nuts, Organic Soy Butter (Organic Roasted Soybeans, Organic Soybean Oil, Salt), Organic Macadamia Nuts, Organic Date Paste, Natural Flavors, Sea Salt, Natural Vitamin E (Antioxidant).